Air (oxygen) is introduced into the ground to increase dissolved oxygen levels to aid the respiration and development of microbial cultures. Nutrients may also be added if the plume is deficient. This facilitates the development of the microbial population to enable organic contaminants to be degraded ultimately into carbon dioxide and water. The addition of the air or oxygen can be via a number of methods including but not limited to air sparging, bioventing, diffusion and oxygen release compounds as well as other more experimental or commercially less viable options. For efficient anaerobic degradation to occur, conditions must be without oxygen (anoxic) as oxygen limits the development of anaerobic cultures. Nutrients again may be required along with inhibitors to prevent the re-oxygenation of the groundwater naturally. Common methods for the provision of electron donors to achieve and maintain the anaerobic conditions are molasses, hydrogen release compounds, emulsified vegetable oils, sodium lactate or cheese whey. Groundwater is abstracted and dosed with nutrients to produce negative REDOX conditions (reducing) within the plume providing further acceleration of the growth of anaerobic microorganism. Organic contaminants are degraded into degradation products. An excellent example of this is the reductive dehalogenation of Chlorinated hydrocarbons such as trichloroethene. Of vital importance is that groundwater is not aerated when it is abstracted, dosed or injected into the contaminated plume. In aerobic and anaerobic bioremediation, supplementary microorganisms (bio-augmentation) can be injected into the plume to improve on naturally occurring microorganisms/bacterial and increase contaminant degradation rates. However our experience has demonstrated this is rarely required. The contaminants present will define if the in-situ bioremediation is aerobic or anaerobic, generally chlorinated hydrocarbons require anaerobic conditions with most others being more effective in aerobic systems. 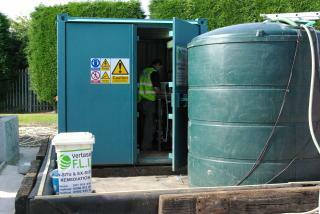 VertaseFLI were contracted to remediate a chlorinated solvent plume at an operational site in Newcastle upon Tyne. The plume of halogenated hydrocarbons was confined within the water table. VertaseFLI designed and built an in-situ anaerobic abstraction and recirculation system capable of delivering Emulsified vegetable oil (EVO) and KB-1 bacteria into the affected plume area. When suitable anaerobic groundwater conditions had been achieved, the plume was monitored to ensure effective and complete degradation of the contaminants. During the remediation of a former tar and chemical works a 50 well in-situ biological treatment plant was installed to degrade a general hydrocarbon and phenol plume within a sandstone aquifer. 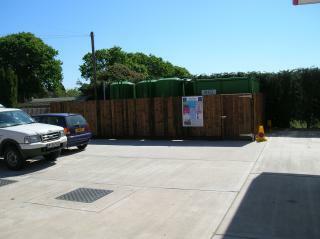 The system utilised warm air blowers to provide sparged air to provide oxygen into the system. Respiration product and volatiles (xylene and toluene) were removed by a soil vapour extraction system. An overall increase of circa 10 degrees centigrade was seen with degradation of phenols to around detection limits and general hydrocarbons to below the remedial target of 1mg/l. The treatment was completed within 12 months. Degradation of over 1 tonne of contaminant. Both remediations were successful and significant reductions in contaminant concentrations recorded to below the risk assessed targets.